I welcome the timely publication of this book on smart materials and their applications in sensors. The actual and potential impact of sensors and sensing systems is enormous and covers multifarious applications ranging from environmental monitoring and protection to pharmaceutical separation and analysis, and from defence and security to medicine and healthcare. It encompasses everything from electronics and materials to biotechnology and nanotechnology. The emerging challenges associated with public exposure to pollution and hazardous substances have fueled an urgent need for novel sensors and sensing systems to support toxicogenomic studies and protect populations. Over the past decades, scientists in this field have been working under pressure to meet these challenges. Sophisticated sensors and sensing materials are now available for evaluation and significant progress has been made in environmental protection, analytical technologies and the development of new materials. Prominent among them are smart nanomaterials, which combine the exciting properties of nanomaterials (such as electrical superconduction, paramagnetic properties and quantum optics) with enhanced diffusion properties and surface area to support a revolution in the design of sensors. This book compiles ten well-organized chapters related to the field of sensors and smart nanomaterials. The emphasis is on highlighting rapid, specific, sensitive, inexpensive, in-field, on-line and/or real-time detection by smart nanomaterials sensors. Singh et al. provide a review in the first chapter on smart nanomaterials and their applications in the field of sensors. Emerging trends and challenges for smart nanomaterials sensors are given in detail in this opening chapter. Diverging disciplines and fields, such as bionanoelectronics, nanotechnology, biotechnology and miniaturization, are exerting remarkable influences on the development of new sensing devices. The chapter by Marrazza is focused on metal nanoparticle-based biosensors. This is a developing field that combines nanoscale materials with biosensor technologies to achieve the direct wiring of enzymes onto electrode surfaces, and to promote electrochemical reactions, as well as incorporating nanobarcodes and signal amplification from biorecognition events. Studies have demonstrated that metal nanoparticles-based biosensors have important potential applications in the fields of environmental and medical analysis, due to their sensitivity, specificity, rapidity, simplicity and cost-effectiveness. Molecular imprinting is one of the latest developments in the field of sensors. In chapter 3, Zhao et al. introduce molecularly imprinted nanomaterials-based sensors. Molecularly imprinted nanomaterials are classified as nanoparticles (including core-shell nanoparticles), nano-wires and tubes, and nanofilms. They review the working principles, methods used and binding events by molecularly imprinted nanosensors. In Chapter 4, Singh and Chen describe thermosensitive polymers and their applications for the prolonged delivery of contraceptive hormones to women. Salaimutharasan et al. review the recent progress made in nanosensors in Chapter 5. Nanosensors are used as the biological, chemical and surgical information sources to convey information. Current developments will allow the transfer of information from a nanoscale space to the macroscopic world. In the following chapter Banerjee et al. study the preparation of CdSe nanoparticles in the presence of self-assembled Abscisic acid (ABA). It appears possible that CdSe nanoparticles may lead to a new family of bio-imaging nanomaterials for cancer cell targeting and, in addition, provide a host for optoelectronic applications. Smith et al describe the fabrication and optimization of a hydrogel delivery system for wound healing in Chapter 7. Zhu et al. introduce, in Chapter 8, the use of advanced carbon nanotubes and fibers in the field of sensors. Carbon nanotube-based biosensors demonstrate potential for the rapid diagnosis of life-threatening diseases. Singh et al. review selected gold nanoparticle-based biosensors. Giuliani and Ge describe 1D nanostructures and their application in sensors in Chapter 9. Nanowires, nanorods and nanotubes are known as the 1-D nanostructure prototype, which is characterized by cross sections as small as 1 micrometer and some microns in length. They can be generated by either adding gold nuclei to a growing solution or by using a template-based method. The 1-D nanostructure offers a significant potential in healthcare and safety. It would take several extensive volumes to cover all the details of smart nanomaterials sensors. Thus, this book can only hope to provide an overview and highlight some of the most important recent researches. The editors have made an admirable attempt to include the most extensively studied areas, which should be of interest to a broad range of investigators and researchers. I would like to thank both Bentham Science Publishers and the leading editor Dr. Songjun Li for their invitation to write this Foreword and to congratulate all the contributors for making this interesting book possible. Thanks also should be expressed to the Research Directorate-General of European Commission and the National Science Foundation of China for supporting this work under both the Marie Curie Actions (No. PIIF-GA-2009-236799 and PIIF-GA-2010-254955) and the National Science Funding Project No. 21073068. It is my hope that this book will provide valuable information to a broad range of researchers. There is tremendous implication in sensors and sensing systems, from environmental survey to protection, from separation to analysis, from electronics to materials, and from biotechnology to nanotechnology as well. Rising challenges in public exposure to pollution and hazardous substances have fueled a stringent requirement of developing novel sensors and sensing systems. Over the past decades, scientists with such backgrounds have been working under pressure to meet this stringent requirement. Sophisticated sensors and sensing materials are now assessable, leading to significant progress in environmental protection, analytic technologies and materials. Prominent among them are smart nanomaterials, which combine both the excellent properties of nanomaterials with smart functional materials, that have caused profound revolution in the understanding of the basic concept of ‘sensors’. Impressive progress has been made in this field due to the employment of novel preparation technologies and methods. The use of smart nanomaterials in the sensing applications enables to alter texture in conventional sensing models into controlled modes. The unique electronic, magnetic, acoustic and light properties of nanomaterials, coupled with smart materials capable of responsiveness to external stress, electric and magnetic fields, temperature, moisture and pH make accurate, real-time and modulated analysis possible. 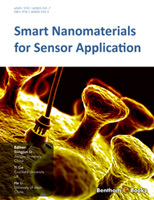 This book summarized the main applications of smart nanomaterials in the field of sensors. The emphasis is to highlight the latest and significant progress made in this field. Other aspects including the use of functional materials into sensing systems, such as molecular device materials, bio-mimetic polymers, hybridized composites, supramolecular systems, information and energy-transfer materials, and environmentally friendly materials, are also described in this book. When providing a relatively comprehensive profile on the current knowledge and technologies, we hope to provide insight into some new directions in this field. As such, this book can be used not only as a textbook for advanced undergraduate and graduate students, but also as a reference book for researchers in biotechnology, nanotechnology, biomaterials, medicine and bioengineering etc. Several books each composed of many chapters are probably not enough to cover all details of this field. Thus, it is very challenging to live up to the absolute and comprehensive summarization. Fortunately, all contributors because of their expert backgrounds have done their best while preparing their chapters. Because of the multidisciplinary nature of this subject, a large number of experts from different backgrounds have been invited to contribute their researches. Without doubt, if there was not participation of such a diverse group of experts, we would not have been able to accomplish our goal of developing a systematical book in smart nanomaterials for sensor applications.